Caroline Troncelliti brings the ball up field. The senior midfielder assisted on a goal in NU’s victory over Ohio State, which pulled the Cats into a tie for third in the Big Ten with the Buckeyes and Indiana. There was only one major common denominator in Northwestern’s two games this weekend: wins on the road. On Friday, the No. 16 Wildcats (12-6, 4-3 Big Ten) limited Ohio State (9-7, 4-3) to just two shots, none on goal, and NU converted on two of its 19 shots on goal for a 2-0 victory. On Sunday, meanwhile, Ohio (8-8, 3-2 Mid-American) stunned the Cats with a pair of goals inside the opening 15 minutes, but NU rebounded via a hat trick from junior midfielder Dominique Masters to secure a 4-2 win. “It was a good weekend, coming home with two wins,” coach Tracey Fuchs said. The Cats’ defensive performance early in Sunday’s game deviated sharply from recent results. 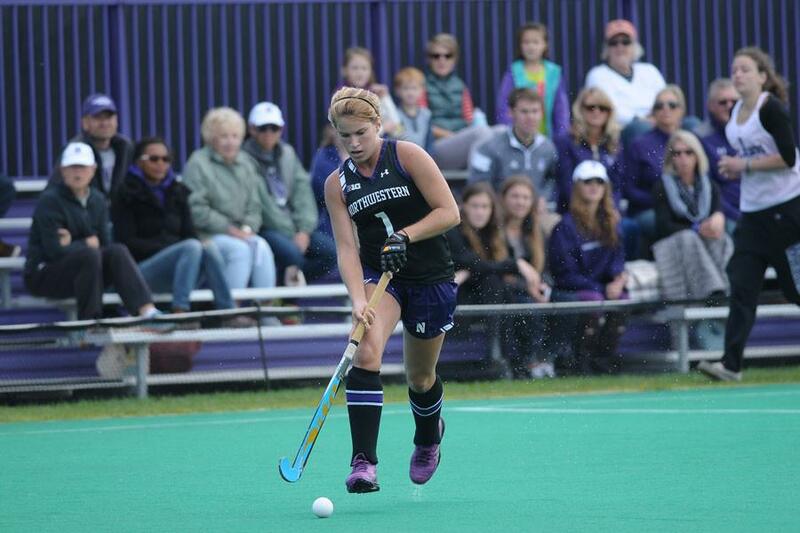 In its two most recent games, NU had allowed a total of three shots and one penalty corner. That didn’t slow Ohio, however, as Clarissa Leickly knocked home Adele Sammons’ penalty corner just three minutes in. Sammons added a goal of her own roughly 10 minutes later. Playing from two goals behind for the first time in over a month, the Cats responded quickly. Masters tallied her first goal of the game in the 29th minute, scoring from close range after a cross from junior midfielder Isabel Flens. Masters scored the tying goal early in the second half, latching onto a feed from freshman forward Puck Pentenga. Masters’ second goal unleashed a barrage of opportunities for NU, and it paid off immediately. Less than two minutes later, senior back Lisa McCarthy tipped in Pentenga’s shot from a penalty corner, giving the Cats a lead they would not relinquish. Masters completed her hat trick within the next 10 minutes, also via a corner. While the Cats faced no such adversity against the Buckeyes on Friday, the match was far from a walk in the park. Ohio State goalkeeper Liz Tamburro made 15 saves, and NU had to deal with normally potent forwards Peanut Johnson and Maddy Humphrey. “It was one of our best defensive performances of the year,” Fuchs said. Masters echoed her coach’s sentiment, highlighting the importance of a late-season conference game. The Cats broke through late in the first half when Flens tipped in a shot from senior midfielder Caroline Troncelliti. Flens, who had 13 shots in the match, increased her team-leading goal mark to 15. Redshirt freshman forward Pascale Massey provided an insurance goal in the 59th minute, knocking in a rebound from junior midfielder Lauren Bernardi’s shot. Friday’s win was particularly important for NU, as Ohio State looms as a possible opponent in the Big Ten Tournament in two weeks. Sunday’s victory was just as critical, however, as the Cats had to fight back to earn the win.